Here is non-traditional idea for your Thanksgiving gathering. I know that roasted turkey and all the traditional side dishes aren't enjoyed by or are practical for everyone. This lasagna recipe includes turkey but in the form of mild or hot turkey Italian sausage! 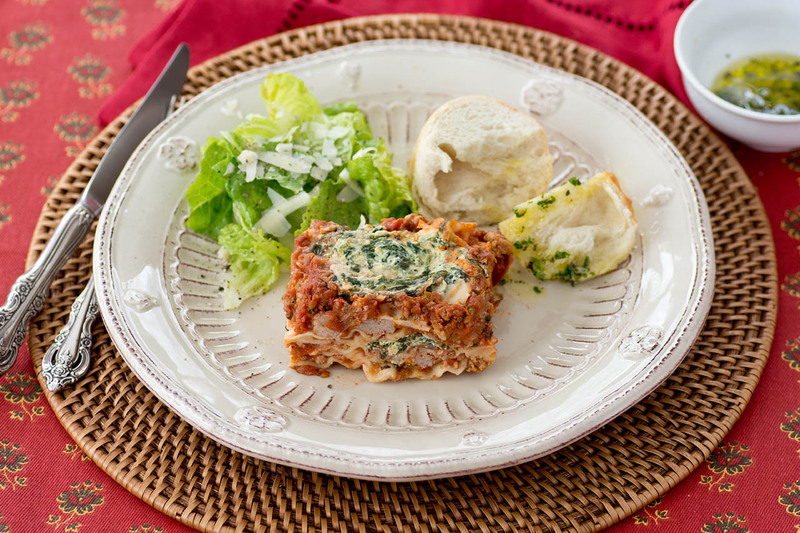 Adapted from an old Bon Appetit recipe, you may already know this wonderfully tasty lasagna. The beauty of this recipe is that it can be completely prepared one or two days ahead of your gathering. All you need to complete the meal is some delicious garlic bread and a favorite salad. I love Ina's recipe for garlic bread, using a little less garlic and olive oil then she does. Today, I used Tuscan-seasoned olive oil for bread-dipping. My secret weapon for squeezing moisture out of the frozen spinach used in this recipe is this easy-to-use potato ricer! It also great for squeezing moisture out of shredded zucchini - not to mention making perfect holiday mashed potatoes. I also used my homemade tomato sauce that I made from my garden tomatoes, recipe here. Feel free to substitute store-bought chunky marinara but homemade always tastes great. This is one easy Thanksgiving (or any time) dinner and your guests will be sure to love it! You might recall in my last few posts, I've mentioned the mild fall we've been having. Not any more! We had our first snow fall yesterday. I hope all of you in the U.S. who may have been traveling to visit family for Thanksgiving weren't delayed by the weather in the Midwest. Makes 8-12 servings, depending on serving size. Tip: Start a few days ahead by preparing the sauce first. Assemble lasagna at least one day ahead. To prepare tomato sauce, heat oil in heavy large saucepan over medium heat. Add onion, garlic, oregano, basil, marjoram and crushed red pepper. Cover and cook until onion is translucent, stirring occasionally, about 10 minutes. Add remaining ingredients; simmer gently, uncovered, until sauce thickens and measures 8 cups total, breaking up tomatoes with spoon and stirring occasionally, about 1 hour 15 minutes. Season sauce to taste with salt and pepper. (Can be prepared 2 days ahead. Cool slightly. Cover and refrigerate.) You may also substitute chunky store-bought marinara sauce and add the seasonings you like to equal 8 cups of sauce. However, if you have time, the sauce is wonderful! To prepare turkey sausage, heat oil in large skillet over medium heat. Add sausages; sauté until brown, using fork to break up meat into coarse pieces, about 7 minutes. Add Spicy Tomato Sauce (You may reserve some sauce for passing at the table, if desired). Simmer 5 minutes. Position rack in center of oven; preheat to 375°F. Whisk ricotta, spinach, 1 cup grated Parmesan, eggs, cream, basil, oregano and pepper in large bowl. Set aside. Spoon 1 cup sauce over bottom of 13 x 9 x 2-inch glass baking dish. Place 3 noodles over sauce in single layer. Spread 1 cup sauce over noodles. Spoon 1 cup ricotta mixture over sauce. Sprinkle 1/4 cup Parmesan and 1 cup shredded mozzarella/provolone over ricotta mixture. Repeat layering with 3 noodles, 1 cup sauce, 1 cup ricotta mixture, 1/4 cup Parmesan and 1 cup mozzarella/provolone. Arrange remaining 3 noodles over cheese. Spoon 1 cup sauce over noodles. Sprinkle remaining 1/4 cup Parmesan and 1 cup mozzarella/provolone over lasagna. Dollop remaining ricotta mixture atop lasagna in 12 equal spaces. Spoon 2 1/2 cups sauce around ricotta dollops. Tightly cover baking dish with foil. (Can be prepared 2 days ahead. Refrigerate until time to bake). My Note: Next time I would make more sauce and reserve at least 2 cups to use for passing at the table when serving. This sauce would freeze well. What a wonderful Mediterranean style Thanksgiving feast, have a wonderful holiday Susan! Thanks, Sue! Happy Thanksgiving to you and your family! Hi Susan, great tip using a potato ricer, I bet this is a softer lasagna than the meaty beef ones, looks absolutely delicious!!!! Happy Turkey day to you!! It does taste lighter, Cheri, and is so good. Happy Thanksiving! Thank you, Gloria! Have a wonderful week! What a wonderful nontraditional lasagna and a great way to cut out some of the calories of lasagna. Thank you, Linda, and Happy Thanksgiving! This is my favorite recipe for lasagna, Jasline. Hope you enjoy it and thank you! a great idea and I love the dollops of cheese on top. lasagne week for you and me! Great minds :) Thank you, Dom! It has been a L.O.N.G time since I last had a bite of lasagna. Now I really crave some, Susan. Yours looks really fantastic with ricotta dollops. An excellent recipe, Susan. Have a marvelous week and stay warm! It was a long time for me also, Angie! This is a keeper and I'll definitely be making it again. 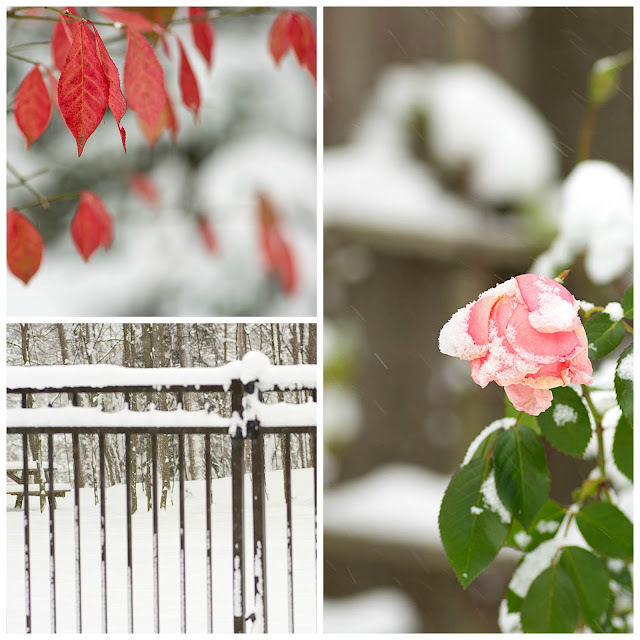 The first snow is always pretty too :) Just as long as it doesn't hang around until April! Thank you, Lynn! 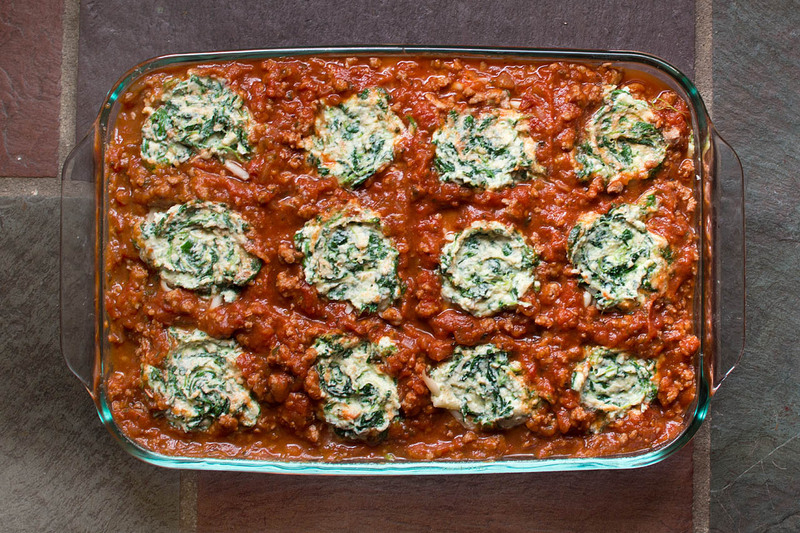 This lasagna looks like a delicious comfort food dish! It looks so delicious. It's definitely been too long since I've had lasagna. It really is delicious and always so nice to have something that can be done ahead of time for a relaxing dinner party. Thank you, Amy! Sounds yummy! I think you're having nicer weather in Wisconsin than we are here in Carolina!! It was rainy and chilly here today this chili would have been perfect! It had been a beautiful fall up until this past weekend! Thank you, Chris! I love lasagna..even more when someone makes it for me..Lasagna is the recipe..that leaves my litchen looking like I am a very messy cook.. It really did change so quickly. 64F just a few days ago and - Boom - cold and snow. This was the first lasagna I've made in so long and I'm sure I'll be making it again before too long it's that good. Thank you, M! This looks so yummy - and absolutely beautiful. I bet it tastes wonderful too. I just adore lasagna and even though I won't be serving this for Thanksgiving - I will make it another time - maybe Christmas. Thanks so much! Hope you enjoy your snow and a wonderful Thanksgiving. With the red and green it would be perfect for Christmas. Thank you, Tricia! This looks delicious! I always serve lasagna on Christmas Eve. I may switch up my recipe. Thanks for sharing. Have the best Thanksgiving! Hugs! Thank you, Bonnie! It's taken me a while to find the time to respond with Thanksgiving preps and getting the house decorated for Christmas. All done! Hope you had a wonderful Thanksgiving. Dose not matter that I have just eaten, I am always starving after reading one of your posts. :-D I have been known to serve non traditional foods on holidays and they always seemed well received. :) Thank you, Glenda! At least it does have turkey in it! We make turkey for Christmas here in Greece and although I love it, sometimes I get bored. This is a great alternative Susan and can be easily reheated next day as well! Such an easy recipe for holiday entertaining or any time! Thank you, Katerina! How beautiful Susan, the snowfall and that yummy lasagna!!! I'm always up for a creative change. Happy Thanksgiving and thank you for sharing so many sweet posts. You're so kind, Renee! Thanks so much! 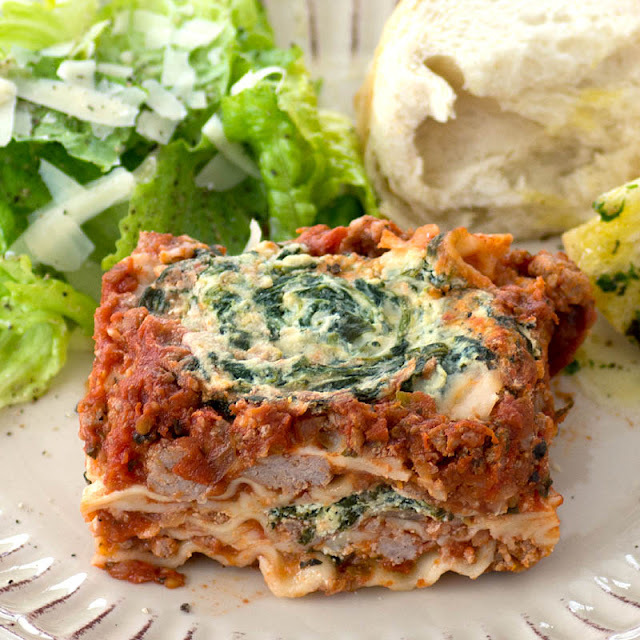 This lasagna looks delicious and I really like how you presented...I love the ricotta dollop! Snow...so pretty...I love seeing snow, so serene...beautiful! I enjoyed eating that ricotta dollop too :) Thanks so much, Juliana. Snow is all gone now! This looks so good. Snow???!!! We had just a dusting last weekend but no accumulation. We're supposed to have ice/sleet/snow on Thanksgiving but we are going to miss it. Headed out on an early flight to spend Thanksgiving with my son in Los Angeles. Hope you and your family have a wonderful Thanksgiving!!! It really didn't last long, Julie, but it was pretty for a short while. Almost 50 here tomorrow. Crazy weather. Thank very much and hope you had a wonderful trip to LA! Hopefully, you weren't near the shootings! I could eat the whole dish. I love lasagna in all forms and this looks perfect! It is going to get cold here tomorrow, so this looks perfect! Have a happy thanksgiving! So could I, Abbe! Thanks so much and hope you had a great Thanksgiving too. This looks and sounds delicious, Susan! My kind of food! But if I served it for Thanksgiving, instead of the traditional spread, I'd be run out of town! Happy Thanksgiving to you and your family! Me too :) I thought for some it might be more practical though. It's a delicious dish. Thanks, Pam! Your lasagna looks delicious! Happy Thanksgiving to you and your family! I have served lasagna before on Thanksgiving. Not this year so I am looking for some leftover recipes. Hope that you enjoyed a blessed day! Hope you saw my turkey pot pie with cheddar biscuits on my sidebar :) Thank you, Vee! Looks delicious! I like the way the spinach both decorates the dish and marks the servings. Pinned. These days I'm a little behind on blogging, but this recipe sounds wonderful Susan! I hope you had a wonderful Thanksgiving. Aren't we all behind? LOL. So much to do this time of year. Thanks, Debbie! It looks delicious, I am very sure it is tasty!! Love this recipe Susan. Turkey sausage and spinach sound perfect for Lasagna. Sorry about your bad weather. Hope it is better now. This is one of the best lasagna's I've had, Penny. Snow is all gone now and we're looking at upper 40's this weekend. Thanks so much! That looks fabulous, Susan. Love the tip about the ricer...why didn't I think of that? I use it for mashed potatoes all the time. No snow here thank heaven, but oh my! The rain! We needed it, but it's poured for three days. Enough! I think it's time for me to make lasagna again! This looks amazing! What a vision --- just what we need tonight! I love that you make your own tomato sauce, I usually use a jar :/ And I think I would definitely go with spicy turkey sausage for this, it all sounds wonderful! Yum and it is so beautiful too. I just made a spinach artichoke one and we have eaten on it for three days. I SO NEED this recipe Susan! I cannot live without pasta and with all my vain attempts at weight-loss and my weakness, this recipe just might be 'the one' to help me out! Thank you so much Susan! pinned to save!!! !